The application is open until February 19, 2018. The early LHC data have stimulated theorists to look for entirely new directions in physics beyond the SM, while abandoning some of the old scenarios. 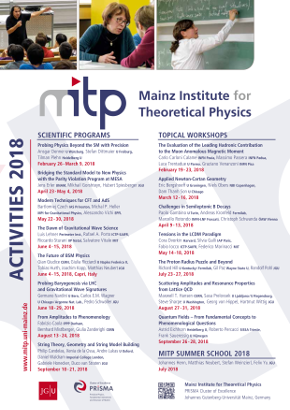 This scientific program is dedicated to reflecting on the theoretical motivation of new physics and exploring radically new theoretical concepts for the current data-driven era of particle and astroparticle physics. This encompasses the theory and phenomenology underlying searches at the LHC, but also in flavour physics experiments, low-energy precision experiments, as well as astrophysical and cosmological observations. Particular emphasis will be placed on extensions of the Standard Model featuring light or very weakly coupled new particles.